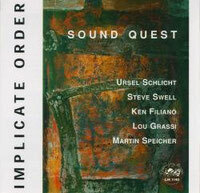 "This multinational cast led by pianist, Ursel Schlicht renders some downright invigorating improv on Sound Quest." "A pulsating force de frappe, SOUND QUEST is an auspicious musical entente." German pianist Ursel Schlicht is a lesser known personality, at least on this side of the Atlantic, but the quality of performance with her group, Sound Quest is enough to raise more than a few eyebrows. Most of the members of the ensemble are well known to readers of this magazine. Trombonist Steve Swell, bassist Ken Filiano, and drummer Lou Grassi have recorded regularly for the CIMP and the Cadence Jazz Records labels, almost always impressively. Martin Speicher is not well known in the States, but based on his performance here, he should be. He performs only on the opening track, Sound and Fury, a fiery, intense composition written by Schlicht which contains some powerful contributions from the whole band and from Speicher in particular. Speicher has played with Evan Parker and Cecil Taylor, and his open, intense voice on alto is likely to come as an eye-opener for those unfamiliar with his work. His lengthy musical conversation with Steve Swell is brilliant, and, in fact, Swell should convince any doubters of his considerable depth and talent as a first-rate trombonist. While the last four tracks (all group compositions) are not as incendiary as Sound and Fury, each presents its own rewards. Implications, for example, opens with airy, wispy tones from Swell, with Filiano’s bass and Schlicht’s piano thrusting quietly. The piece slowly builds and though largely formless, the lengthy collective improvisation, with Grassi an integral part, coalesces impressively. Sound Quest features a fine contribution from Filiano that relies on subtle feel as much as technical skill. The piece evolves slowly, with group dynamics the focus. Crescendum has a chamber feel, with romantic piano, muted bone, and string bass juxtaposed against Grassi’s finely nuanced percussion. The short and somewhat static Tacit Agreement favors Filiano’s bass with muted bone and piano and drums flitting in and out. Schlicht’s presence is embedded throughout, her vision holding the threads together, and her piano a constant, though often implicit, presence. The impression of the recording as a whole is one of focus, attention to detail, and elegance, coupled with strong improvisational displays. A resounding success. This live set was recorded in March 2001 in the German provincial town of Kassel, where, along with fellow locals Hans Tammen on guitar and reed player Martin Speicher, pianist Ursel Schlicht started her musical career a decade or so ago before moving to the US in 1994 (her Statements Quintet album "The Cats Pyjamas" (Leo Lab 054) is well worth checking out). Implicate Order (the name is culled from physicist David Bohm, referring to "that which cannot be seen but is ultimately responsible for seemingly random small behaviours [sic]") is Schlicht's current quartet with trombonist Steve Swell, bassist Ken Filiano and Lou Grassi on drums. Martin Speicher (whose "Erdtöne - Notation des Lots" on Hybrid must be one of the most criminally neglected masterpieces of recent times) guests on alto sax on the opening "Sound and Fury", and if his opening duet with Swell doesn't blow you away, just you wait for his solo later in the track. While Swell is his usual impressive craggy self, Filiano and Grassi are at their best in the faster tracks, where their tight free-bop energy propels the music onwards and upwards (Filiano also contributes a well-crafted six-and-a-half minute solo to introduce the title track, but his interventions on the final "Tacit Agreement" are a little too busy for my taste). Schlicht's piano work can range from deft pointillism to actual bodily harm, yet her occasional right-hand octaves and Skriabinesque harmonies reveal a strong grounding in classical technique.